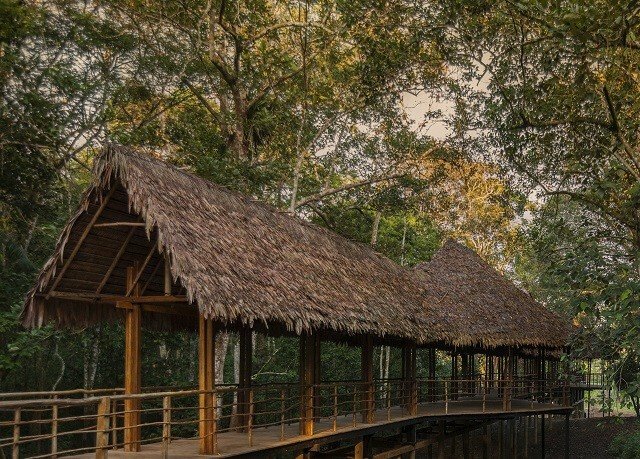 On the black waters of the Yarapa River in the heart of the Peruvian Amazon sits Treehouse Lodge, a 345-acre rainforest preserve. 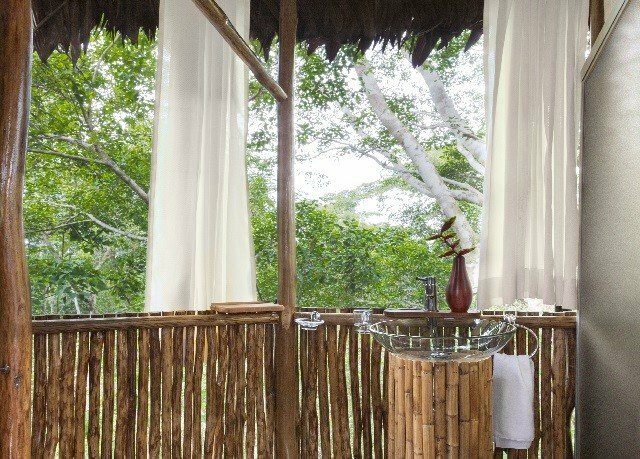 This TripAdvisor Certificate of Excellence-winning jungle habitat boasts unparalleled access to the wonders of nature, with its unique lodgings set high in the canopy. Between the primary-growth rainforest and the hotel’s eco-friendly measures, such as using solar power to self-generate electricity, this stretch of tropical land is essentially untouched. During your stay, you’ll benefit from unforgettable excursions to appreciate the local plant life and wildlife, although there’s more than enough nature to go around on the property itself. 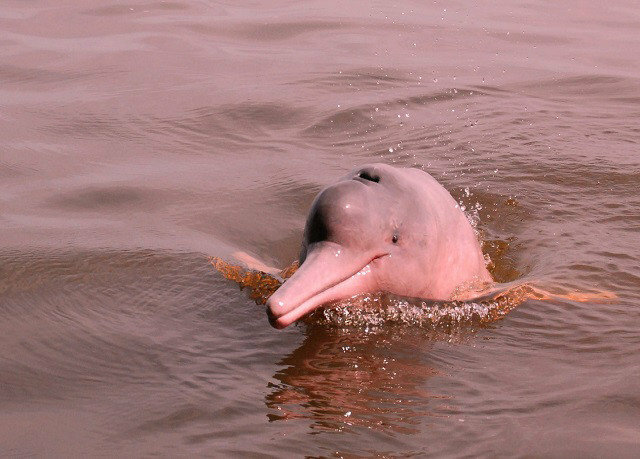 On the premises, you’re likely to see five species of monkeys, colorful macaws and parakeets and, if you venture to where the Yarapa meets the Ucayali River, even a pink dolphin. If it sounds extraordinary, it is – here in this beautiful stretch of the rainforest, extraordinary is perfectly normal. 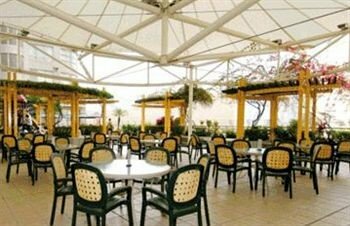 The hotel is committed to making its setting comfortable for all its guests. 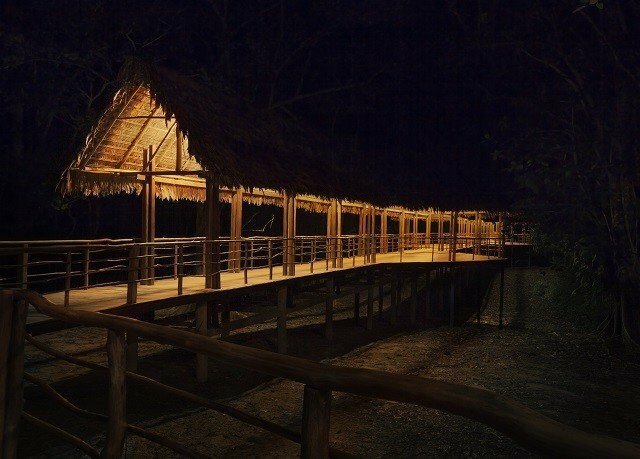 Staff will transport your luggage to and from your Treehouse, and paths are lit at night to ensure a safe walk to and from the lodge. Mosquito netting protects every bed. Consistent with the property’s eco-friendliness, showers feature only cool water. 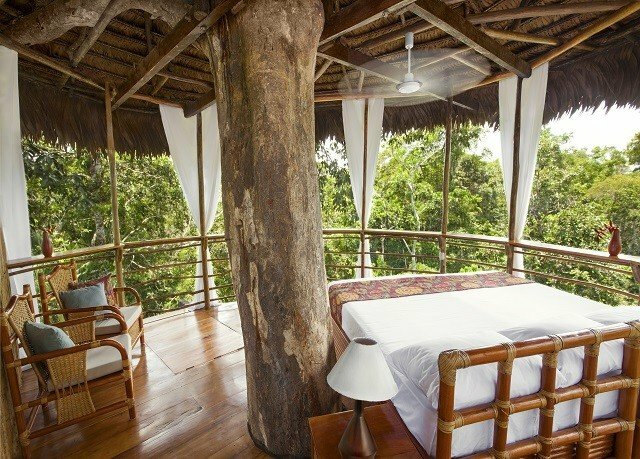 Treehouses are breathtaking structures, set high in the trees in the middle of the jungle. You’ll find them equipped with fresh, white linens, a sink, a toilet and a shower, plus comfortable and tropical-inspired furniture, including one king or two twin beds. The showers only supply cool water, but after a day of adventure you’re sure to enjoy the refreshment. 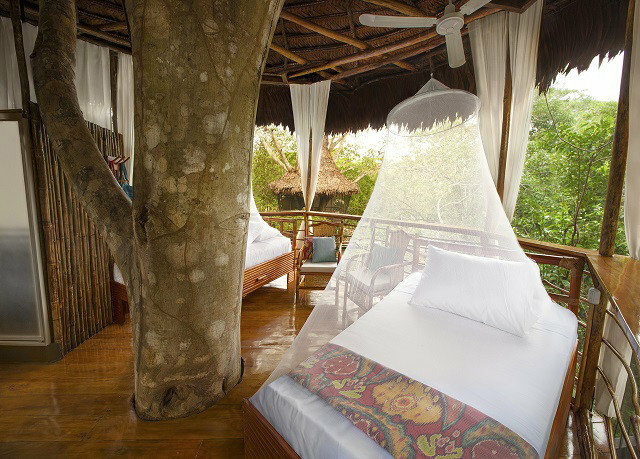 A fine layer of mosquito mesh around the Treehouse and every bed allows you to appreciate nature without distraction. Enjoy three Peruvian meals a day at the Main Lodge, which provides shelter from the insects and the elements. 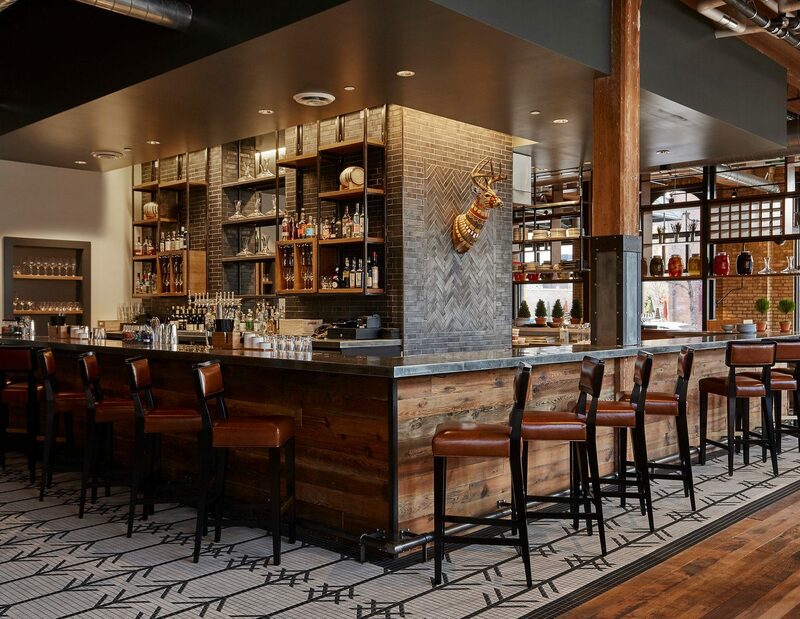 Inventive dishes of protein and vegetables will nourish and satisfy you during your stay. Set on the Yarapa River, a tributary to the Amazon River, Treehouse Lodge is an Amazonian sanctuary. It has 345 acres of preserved Amazon rainforest to its name, plus protected land surrounding it, so you’ll feel completely immersed in an untouched portion of primary rainforest. Treehouse Lodge is also located near Iquitos, Peru, considered the capital of the Peruvian Amazon. Here, you’ll find the largest traditional market in the region, plus incredible biodiversity at every turn. My 24 year old son and I (age 60) stayed at the Treehouse Lodge - Treehouse 7 - April 8-12, 2019. It was honestly the best vacation I ever had. From the moment our guide, Marden, picked us up at the Iquitos airport till he dropped us off at the airport I felt I was in good hands. Marden, Gustavo, and Martin made us feel like we were part of their family. I truly appreciate every moment spent with them - above and beyond my wildest expectations. Marden and Gustavo brought us on expeditions around the clock - whenever and whatever we wanted to do. We saw pink and gray dolphins feeding at sunset,caught piranha, cruised day and night pointing out so many different species of birds including toucans and macaws, 5 different varieties of monkeys, sloths, porcupines, boa constrictor, butterflies and dragon flies - so much jungle life. We caught several different varieties of fish. We caught a Cayman at night. A favorite outing was visiting the village where Gustavo and his family lived. 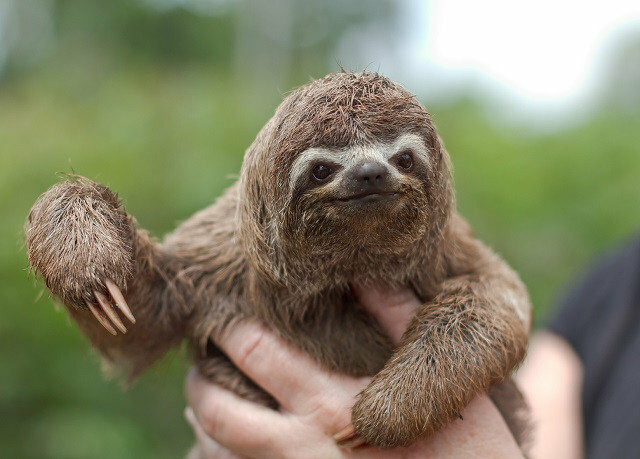 We were able to hold a sloth that was so precious. Gustavo’s father shared his anaconda with us. It must have been 9 feet long. My son wrapped it around his body like a cloak. The village had its own school, grocery store, and even a jail. There were children running on the soccer field, playing with pet McCaws and dogs, while families smiled from their homes. They were so inviting. When we came back from excursions Martin always had an ice cold towel to cool ourselves off with along with fresh seasonal fruit juices. The meals were incredibly delicious. They were fancy gourmet presentations! Breakfast buffets daily along with eggs and omelets fresh to order, 2 course Lunches, and 3 course dinners. A favorite was heart of palm. You’re not going to get fresher fruit, fish, vegetables, and chicken any where. You won’t be disappointed. In addition to your meals they will cook your fresh fish catches. It’s in the restaurant and bar area that my son became close friends with Martin. They would teach other Spanish and English late into evenings daily. Martin’s and Maren’s personal stories enriched our experience more than they will ever know. While on a walking expedition through the jungle, Gustavo made me a fan and basket from palm leaves and vines. His skills amazed me. Because my son mentioned he would like to swing from a vine, with machete in had, he cleared and area and swing they did! Marden and Gustavo accompanied us daily customizing our adventurers. One afternoon they and my son ventured out on kayaks where they could venture into tight spaces and truly experience the sounds surrounding them. Don’t forget to seethe spectacular water lilies! They are huge with flowers the size of cabbages. I can’t say enough about The a Treehouse Lodge and all its wonderful staff. I want to go back! Our family of 5 (2 adults and 3 kids, aged 11-15) stayed at Treehouse for 3 days and 2 nights during our Peru trip, and we all agreed that it MORE than lived up to our (very high) expectations. The lodge itself is unique and beautiful--when do you actually get to live your childhood dream of living in a treehouse? Each family is assigned a personal guide who is with you from your airport arrival through your departure, every step of the way. Our personal guides, Christian Silva and Roberto Pinero, were incredibly knowledgeable, helpful, and friendly-- do not hesitate to ask for one of them by name when you visit this amazing place. They took us on fabulous expeditions to swim in the river while pink dolphins were playing, catch pirañas, see monkeys, find caimans at night, and visit a local village. Finally, as an unexpected bonus, the Treehouse food was FANTASTIC-- local ingredients, varying fresh juices, delicious gourmet 3 course meals beautifully presented at lunch and dinner-- all from a tiny kitchen in the middle of the jungle. Truly amazing. Every single person at Treehouse was beyond friendly and helpful. 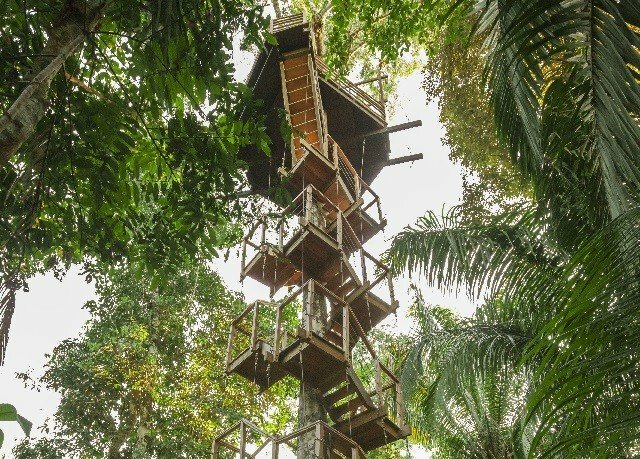 I would recommend the Treehouse to anyone wanting a wonderful and unique (but still very comfortable and high level of service) adventure in the Amazon. My girlfriend and I just got back from our stay at the Treehouse Lodge and have nothing but positive things to say about it. The excursions were life changing, the rooms were fun, and the staff was incredible. Anything we needed they were accommodating and helpful with. They took things the extra mile to make our stay the best it could be. Thank you! My husband and I travelled to Peru with my sister, her husband and their three children. When we arrived at Iquitos, our guides, Roberto and Christian, were there to meet us and take us on the car/boat trip out to the lodge. Roberto and Christian were both extremely knowledgeable about local flora, fauna and history. For the duration of our stay, Roberto and Christian, together with our boat drivers, were available exclusively for us. They helped us determine what activities to schedule and generally made everything extremely easy. As for the lodge, it was fun sleeping up in the canopy but with all the comforts of home, like a bathroom and a comfortable bed. Falling asleep to the sounds of the jungle at night was magical. All meals were included with our stay and I CAN NOT say enough about the food we had there- it was superb, featuring fresh fish and local fruits and vegetables. Later in our trip we ate at a Relais & Chateaux hotel, famous for its reataurants, and it paled in comparison to the amazing dishes we were served (2 course lunches and 3 course dinners) at Treehouse. Our visit was during the rainy season, so there is not much hiking available, but you can visit all the places you might hike to by boat through the flooded jungle. We fished for pirrana, saw monkeys, sloths and an amazing variety of birds, which Roberto and Christian were experts at spotting. Roberto, the best hand with a machete I have ever seen, guided us through the flooded forest by boat at night, and even caught a small cayman by hand for us to see up close! 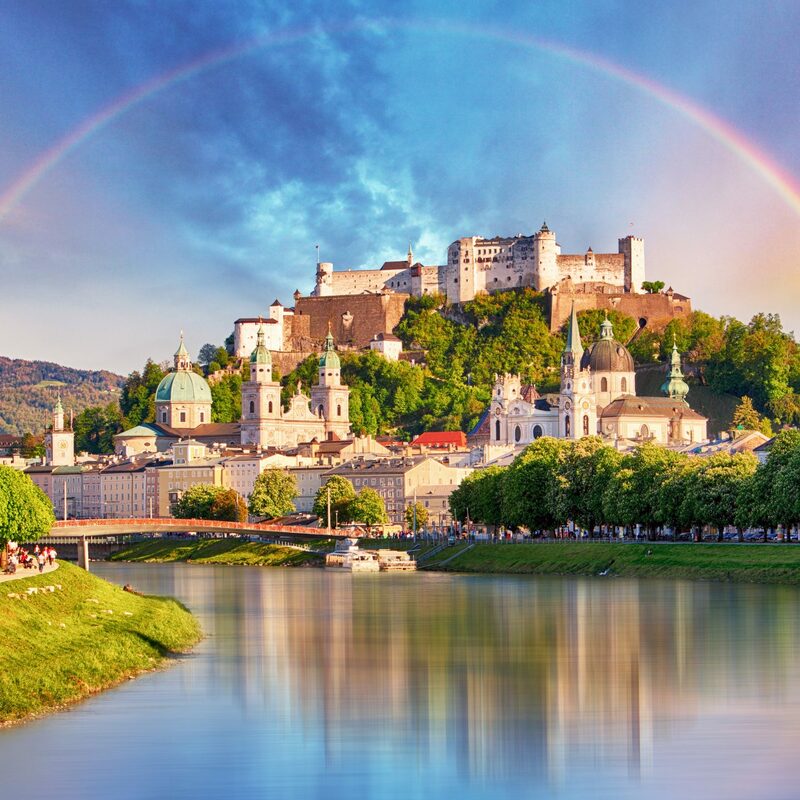 If you want to see (and hear) one of the most beautiful places in this world, and you don’t mind getting a bit hot and sticky, this trip is a must. 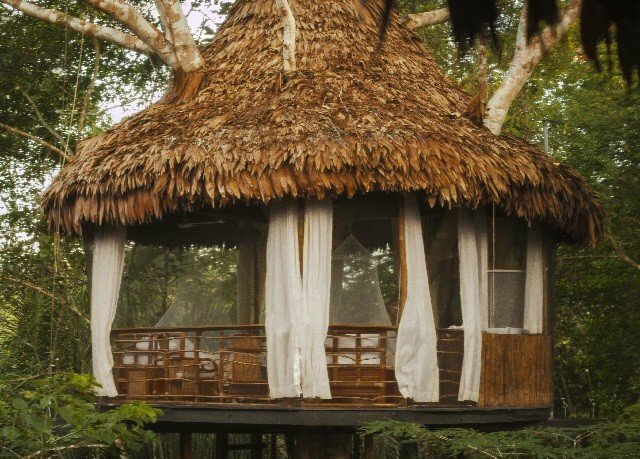 The treehouses offer a unique experience and the guides, boat captains and kitchen staff will make sure that you have an incredible trip. 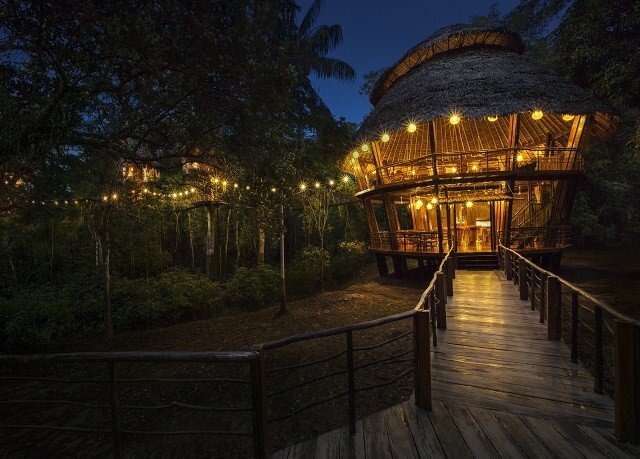 We just came back from a fabulous trip to Peru and the Treehouse Lodge made the whole adventure uniquely memorable. Our guide, Christian Silva, was incredibly knowledgable and made the trip a fascinating and seamless one with every detail taken care of from the moment he picked us up at the airport. He really worked hard to make sure it was the best trip it could be. He was great with our children (age 9 and 11) and we all saw incredible animal life and experienced much about the Amazon and what wonders it has to offer. The hotel itself was a special and lovely experience - amazing to sleep with the sounds of the amazon all around as you lie in the treetops - and the food at the lodge was excellent, which was an unexpected plus. All in all, a fabulous start to our Peruvian adventure.